On May 14th during Alumnae Reunion Weekend, Elizabeth Dove, ’84 assumed her role as the next President of the Meredith College Alumnae Association. 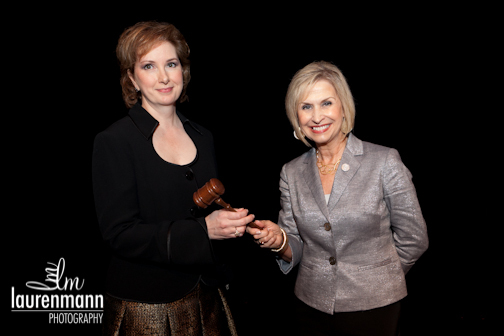 The gavel was passed from Deborah Jordan Matthews, ’74 in a ceremony at Saturday’s Annual Meeting. Look for regular updates from Elizabeth on our blog, as she meets with Alumnae from around the country and shares new ideas on how our Alumnae support and strengthen Meredith. To read more about Elizabeth Dove, ’84, please visit the Alumnae Spotlight page by clicking here. As always, if you know of an alumna who should be featured in an upcoming Alumnae Spotlight, please feel free to email us at alumnaeblog@meredith.edu.